As a photographer, I’m sure you’ve been in those situations when people ask you to work for peanuts, or even worse – for free. Not many things annoy me as the sentence “Come on, it’s only a few snaps.” No, it’s not. Of course, there are some instances when you can and should work for free. But you shouldn’t undermine yourself and your work. The artists also have bills to pay. 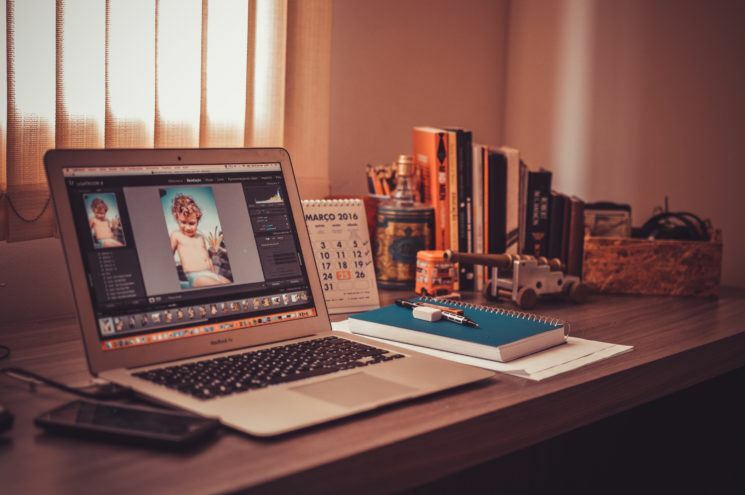 However, it can be unpleasant and tricky to tackle the situations when you are asked to do free or low-budget projects, or those that don’t suit your terms. This is why Jessica Hische has created a handy tool to help you cope with situations like this and choose proper reply for different offers. “Should I work for free?” is a question many creatives ask themselves, especially in the beginning of their career. 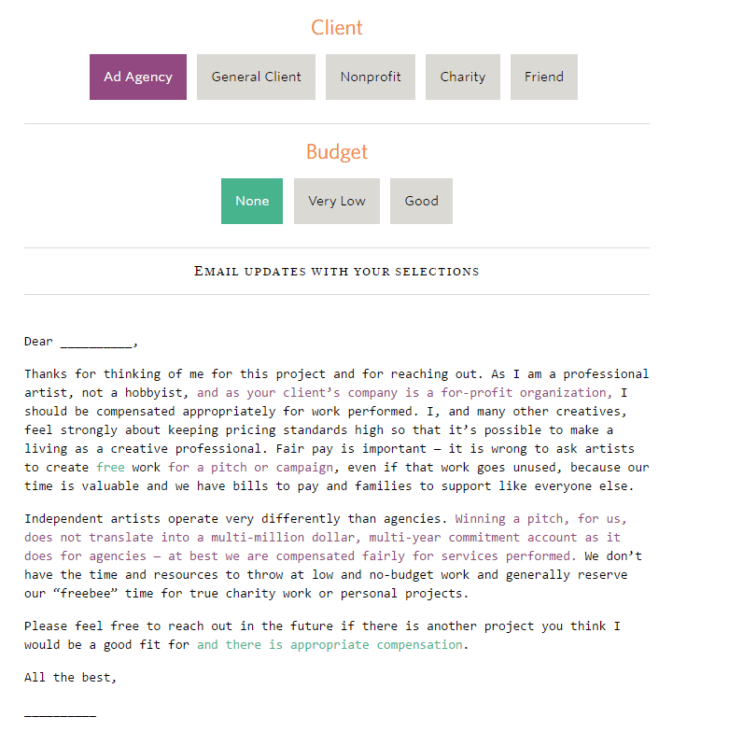 After creating a helpful and funny chart to help you decide, Jessica has now designed Client Email Helper – a tool to help you say “no” to free and low-budget projects, as well as those that don’t fit your terms. Also, she includes the templates that will help you ask for more favorable contract terms before you start a project. The tool offers you to choose between five clients (ad agency, general client, nonprofit, charity and friend) and three levels of budget – none, very low and good. 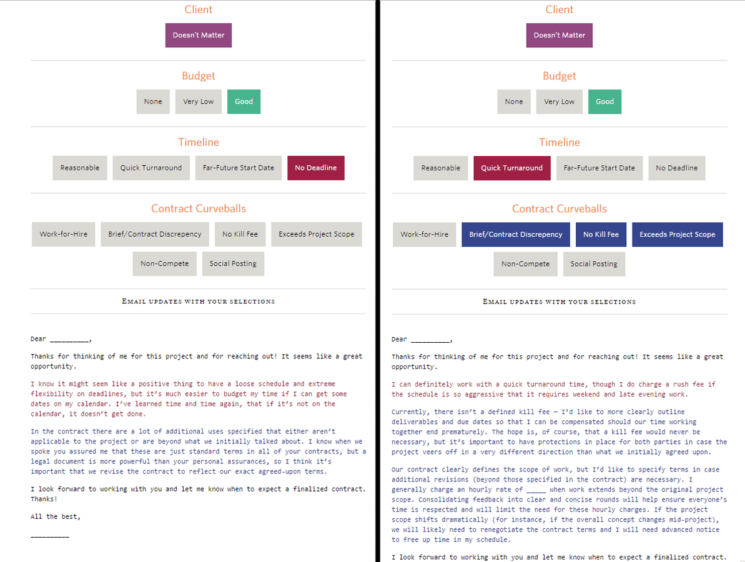 Each of the combinations you choose gives you an email template with a suggested reply for the client, based on who they are and what budget they (don’t) offer. If the budget is good, you get to choose the timeline and contract curveballs in addition to client and budget. Jessica is a designer, but it seems that she had all creatives in mind when she created this tool. The generated replies can be applied to photographers, videographers, designers and all creative people who make a living out of art. What I particularly like about this tool is that the tone of each email template is polite, but still reflects firm attitude and professionalism. I sometimes find it hard to say “no” to unpaid projects and find myself in an unpleasant, energy-draining situation. For those like me, this could give you inspiration how to do it without offending anyone, but also without damaging your reputation. Another thing I like is the color code, so you can see all the changes and realize to which part of the tool they are connected. It’s difficult to find your place in the creative world, I know. But we should all respect ourselves and our work. Click around Jessica’s tool to get inspiration how to refuse or accept the offer so it’s good both for you and the client. And feel free to adjust the email templates so they fit your working terms. Be creative. After all – that’s what we do.